Which is the best product to trade? People often want to know which derivative is the best. Is a futures contract better than a CFD or vice versa? It is not easy to answer this question because the derivatives are not the same. Some methods which can be employed with options or futures cannot be applied to CFDs. This notwithstanding, CFDs are a great instrument to trade. What are my options when trading Options? An option is a freedom to buy or sell a certain number of shares, say 100, on or prior to a set date. This, however, is the freedom to choose to buy or sell, and not a compulsory requirement to do act one way or the other. In trading in CFDs, the seller and the buyer must sort out the difference in cash at the end of the business. The trader in CFD can choose as little as one contract to be the size of his position. This point is important for those who are just beginning or who are testing a new system of trade. Why are CFDs much easier to understand than Options? In trading options, a small premium is paid out which enables the trader to have access to the movement in the share for a certain time. If he is right, he receives an amount of cash in return. But if he is wrong, he loses the small premium. Options are more complex than CFDs. CFDs trading is quite similar to trading the underlying share. In trading options, one can decide to write options. It is, therefore, possible to combine options to produce different strategies that are not possible with CFDs. The CFDs have no corresponding process. There is a wide choice of instruments to trade in CFDs. It is possible to trade more than 10,000 trading instruments with some CFD brokers. In addition, indices, commodities, and forex can also be traded. There is no such choice available with any other derivative today. The number of buyers and sellers available at any particular time is referred to as liquidity. Transacting at the preferred price is easier with an increasing number of buyers and sellers. Where the buyers and sellers are few, it is called an illiquid market. It is difficult to buy and sell at one’s chosen price. 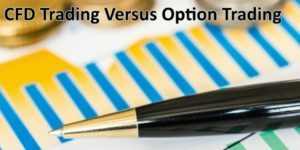 You can either buy or sell one of the two types of options, either a call option or a put option. If you believe the instrument is going up, you buy a call option. But if you believe the instrument is going down, you buy a put option. If your evaluation of the direction of the movement is correct, you can make a profit. However, if it is wrong, you are likely to lose the premium you paid. With CFDs, you can trade both long and short easily. In short selling, the position is opened by selling it, and closed by buying it back. There are no complex rules to follow or different instruments to use. It is easy to understand and trade CFDs. This is not to say there is no risk involved. You must understand the risks involved before beginning to trade. Why does my head hurt when learning options? The faint-hearted may not be able to engage in option pricing. The share price, exercise price, volatility, time, dividends and interest rates, all affect it. But CFDs are quite simple because they coincide with the underlying instrument. With CFDs, there are no difficult pricing models to learn. As little as one contract controlling one share CFD, compared to one contract controlling 100 shares with options. It is difficult to learn options, but easy to learn CFDs. Those who know how to trade stocks also know how to trade CFDs. CFDs have no expiry dates, whereas options do. Those who hedge their stock portfolio using CFDs can be paid every day they are short. There is a wide variety of trading methods to choose when using options.